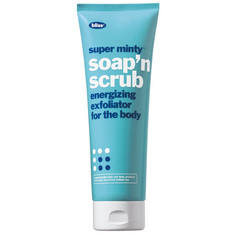 About a month ago, I discussed the incredible wonder that is Bliss Super Minty Soap 'N Scrub. This has quickly become one of my very favorite products -- the minty scent is invigorating, the scrub stimulating, and the experience using it all around intoxicating. So I'm thrilled to offer today's giveaway, in which five people will win a bottle of their very own! This giveaway has a retail value of $32. To enter, use the Rafflecopter widget below. Good luck! This giveaway ends on Thursday, August 15 at midnight. Five winners will be chosen AT RANDOM on Friday, August 16. Multiple entries will be disqualified. Giveaway is open to US residents only. My #1 tip for exfoliating is to make sure you wear sunscreen on any part of the body you exfoliate EVERY SINGLE DAY. You are exposing fresh, new skin cells that are very sensitive to UVA/UVB rays. If you want to maintain that beautiful skin, you need to make sure to protect it with SPF or you are just wasting your time exfoliating it in the first place! Do exfoliation 2x a week only. Overdoing can lead you to dryness and probably acne. Don't "rough" it. A light, soft exfoliation will do the trick. You can irritate your skin if you use something too harsh or rub too hard. That can make things worse! Don't rub too hard and always on circular motions. My tip for exfoliating is to always use a good serum right after as it's the perfect time for the skin to absorb it! Don't think you need to scrub so hard when you exfoliate. Those little beads or whatever is in your product will do the work all on there own! Don't forget to moisturize after exfoliatiing! Just do it! Soda works pretty good or sugar. When exfoliating your face use gentle, circular motions on damp/wet skin. Don't over exfoliate. Keep track of chemical and physical exfoliation. Only exfoliate 2x a week! You can really damage your skin by over-exfoliating! And always moisturize after! I'm not very experienced with exfoliating, but I'm always sure I don't scrub too hard. Gently massage it into your skin. You're exfoliating, not sloughing off your skin. Be gentle but thorough. Consistency is key! It is so helpful! Be sure that the exfoliant that you are using has perfectly spherical particles to ensure you are not scratching the top layer of the epidermis. My exfoliation tip is to make sure you use the scrub and a small patch of skin first to test for any allergic reaction. Exfoliate at least once a week! You should exfoliate twice a week. I prefer a micro exfoliating scrub that get's deep into my skin. Exfoliate no more than twice a week. You CAN overexfoliate. My tip is don't rub too hard and always on circular motions. I exfoliate my lips with Lush's minty lip scrub. It is fantastic! For my body I love Sweet Cheeks by Cake...smells like a cinnamon bun. I make sure to do it before I use any other products. It gives a smooth base for the others to work. Be gentle while exfoliating, especially for those with sensitive skin! My tip is to exfoliate very gently and to never scrub or rub.